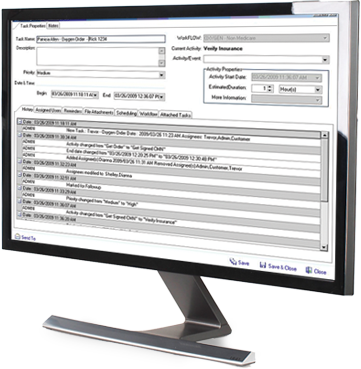 Medforce CommandCenter empowers you to build the most efficient organization possible. Our business process management (BPM) tools enable you to easily perform work based on strategic priority, returning more dollars for your effort. Our platform enables you to map, monitor, and optimize how you operate your business. CommandCenter software is completely tailored for each business and puts you in control. You use our intuitive workflow creation tools to program the who, what, and when of each process to ensure all work is complete, accurate, and on time. The built-in business analytics reports, customizable views and dashboards mean you and your employees never miss a step and always tackle the highest priority work first. To download a summary overview of CommandCenter, please click here. Stay on track, stay informed, and stay ahead with Medforce CommandCenter.